The decades-old Art Institutes colleges are facing potential insolvency a little more than a year after the former for-profit chain was acquired by the faith-based Dream Center Foundation. The nonprofit reportedly completed a deal to transfer ownership to another organization. Struggling under the debt load it took on along with the college chain, Dream Center Education Holdings (DCEH) has circulated a plan to transfer control of the chain to another nonprofit, Education Principle Foundation, according to a proposal sent to one of its accreditors. Higher ed regulator Washington Student Achievement Council (WSAC) designated the Art Institute of Seattle "at-risk" of closure late last week and this week suspended its authorization after a surety bond to protect student tuition was canceled. The suspension means the school can operate but cannot recruit or enroll new students. On Monday, DCEH Chairman Randall Barton told employees that the organization, with the help of the U.S. Education Department, had reached a deal to transfer ownership, according to an email obtained by the Republic Report. An Ed Department spokesperson told the Pittsburgh Post-Gazette that DCEH no longer holds an ownership position in "most" Art Institutes. Dream Center and the Ed Department did not reply to Education Dive's request for comment. When the Dream Center bought the Art Institutes from Education Management Corporation (EDMC) shortly before it filed for bankruptcy, the organization described the deal as "an amazing opportunity" to "turn those systems into community focused not-for-profit educational institutions." The foundation —which tapped Brent Richardson, former CEO of Grand Canyon University, as DCEH's chief (though he has since stepped down) —saw opportunities to combine them with its other charitable programs involving workforce readiness and education. But the initial opportunity Dream Center saw has unraveled in fairly short order. In the restructuring proposal sent to the Northwest Commission on Colleges and Universities (NCCC), an official with the Art Institutes cited the "vast amount of debt" that Dream Center inherited from EDMC as behind a challenge "to stabilize the institutions and improve operational efficiencies." Dream Center had already indicated it would close most Art Institute campuses by the end of 2018. The reorganization plan called for Education Principle Foundation, formed in 2013, to take over control of the Art Institutes while keeping existing Art Institutes staff onboard. Many support services for the Art Institutes, per the plan, have already been transferred to a limited liability corporation called Studio Enterprise Manager, formed in Delaware last summer. The Republic Report connected the LLC to educational services company Studio Enterprise, which has been negotiating with DCEH for months, according to the news site and the proposal submitted to NCCC. As part of the restructuring plan, Studio and other lenders would provide a $6.4 million loan to keep the Art Institutes operating. The restructuring plan included the Art Institute of Seattle, butthe campus indicated to WSAC that it is no longer part of the arrangement, and to WSAC's knowledge the campus is still owned by Dream Center. If the campus does or did change ownership without going through the proper process, it could lose entirely its authorization to operate in Washington, WSAC deputy director Don Bennett told Education Dive. Based on restructuring documents, the plan pertained to "all existing Art Institute campuses to preserve their ongoing operations," though it is not clear exactly how many campuses are open and included in the restructuring plan. Dream Center's issues managing the Art Institutes after the acquisition have not been limited to finances. Last month, four Art Institutes students filed a class-action lawsuit against the operator over allegedly misleading them into believing it was still accredited after the Higher Learning Commission (HLC) pulled its accreditation following the sale. HLC put the Art Institutes on candidacy status and told them to notify students of the accreditation loss, according to the suit. Instead, many students found out about the loss of accreditation from news reports and were left to scramble for refunds and answers to questions about what it meant to have earned credits from an unaccredited college. According to the Illinois complaint, the answers students received from DCEH leaders were often vague, if not conflicting, including statements from DCEH's chief operating officer directly to students. South University will also be transferred to Education Principle Foundation, according to the Republic Report. 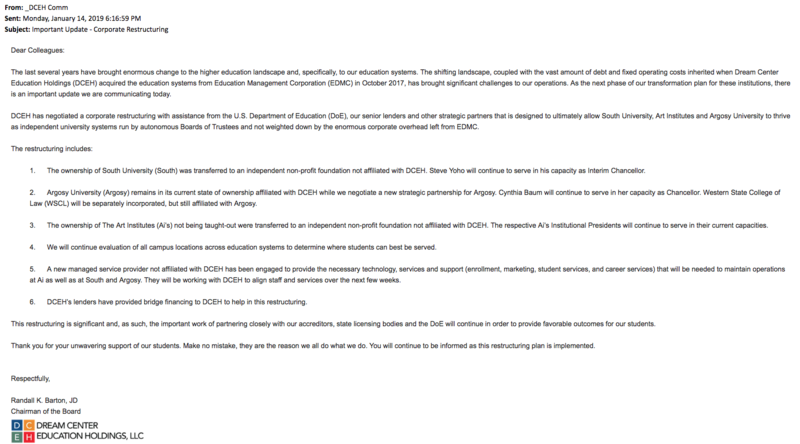 Argosy University will remain under DCEH while it negotiates a "new strategic partnership" for the chain, Barron told employees by email. Both South and Argosy were part of the deal with EDMC.